Hotel Crowne Plaza - Le Palace is located between the Botanical Gardens (Kruidtuin/Botanique) and the Rogier square (Place Rogier/Rogierplein), and easily accessible by public transport. The railway station Brussels North (Boordstation/Bruxelles Nord) is a 10 minute walk, while the Metro station Rogier is 100 meters from the entrance. During big events like our conference, the back door on Place Rogier is often closed, so you have to take the main hotel entrance on the east side, next to the Botanical Gardens (rue Gineste 3). 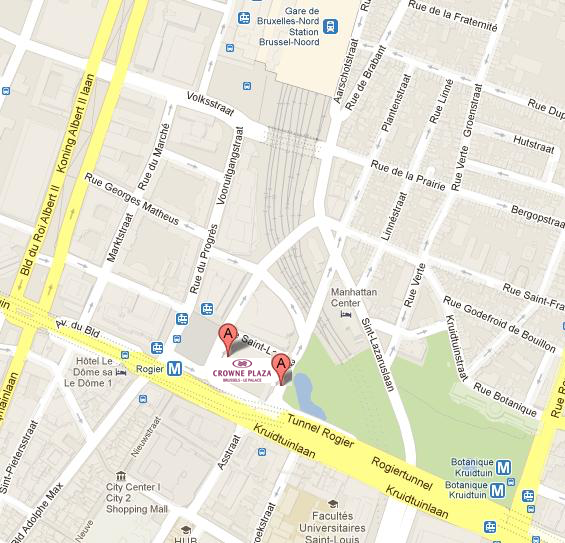 To locate the hotel in Brussels, take a look at the Google map of the workshop venue or this Brussels City Center map. Gare du Nord / Brussel Noord is the closest train station, being only a short 10 minute walk from the hotel. If you come by train from the UK or France, you'll arrive in Bruxelles-Midi/Brussels Midi/Zuidstation with the Thalys or Eurostar, and there is an express train to North Station every 15 minutes. Leave Brussels North train Station in the South direction. It is about 6 mins walk to the hotel if you take the back exit into rue de Brabant, and walk it down until you see the Rue du Gineste/Ginestestraat on your right. Another option is to walk down the Rue du Progrès until the square Rogier and you will see the hotel on your left-hand side. This is the back entrance and may be closed during large events. In this case, take a walk around the block and come in via the front door. It may be a good idea to have a quick look at a Maps app before you start walking, but you can really do it in 6 minutes if you take the shortest route. The easiest way is to take the airport train which usually takes less than 20 mins to Gare du Nord/Noordstation/Brussels North Railway Station. The train costs something like 10 euro per person, cheaper than a taxi or an Uber. 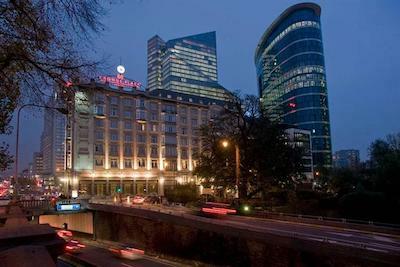 Because the hotel is situated on the Brussels inner Ring, so it is very easily reachable by car. When entering Brussels follow Direction: "Brussels Centre", exit Botanical Gardens/Jardins Botaniques/Kruidtuin. You will find the hotel situated between the Botanical Gardens and Place Rogier. Parking facilities: "Place Rogier". The hotel has no separate parking. There are 5 public parking spaces in the immediate area, of which the Parking Rogier (see the Interparking Web site of Parking Rogier) and Parking Botanique (see the Interparking Web site of Botanique) are the closest. We have a Brussels City Center map for you to download, with 10 things to know about Brussels and the metro map. If you are looking for accommodation, please contact the Hotel Crowne Plaza directly: +32 (0)2 274 58 93 , email: info@cpbxl.be. However, there are many other hotels, large and small, brands like Hilton, NH, Thon or brandless, and of course Airbnb places in the immediate area.